That's Boston, Georgia's unaltering date for its annual Mini Marathon and the festival that has grown up around it. And on the morning of 2010's "Last Saturday in October" the 13.1-mile race was held for the 31st time, starting as usual in downtown Boston and heading out-and-back on the road to Dixie, Georgia. This time around, Vince Molosky successfully defended his 2009 title with a run of 75:13, over four minutes faster than he had run the previous year. Molosky finished about a kilometer ahead of the runner up, Carl Nordhielm, who was also the top master runner in the race. The next master runner, Tony Guillen, edged out Keith Howell for third place overall, 82:13 to 82:18. The women's title went to Lisa Johnson; Johnson placed tenth overall in 86:59. Johnson was nearly a kilometer and a half in front of the next woman, Olivia Swedberg, who finished 25th overall in 93:37. The third woman across the finish line was Lisa Dillman, who was also the top woman master in the race. Dillman ran 95:22. For the fourth year in a row, the Florida State women's cross country team has come away from the Atlantic Coast Conference championships with the league title. And for the first time in FSU history, the men won the ACC meet, making it a clean sweep for the Seminoles. The ACC meet was hosted by Boston College on Saturday morning on the grounds of Franklin Park in Chestnut Hill, Massachusetts. Competition opened with the women's 6K race. North Carolina State freshman Laura Hoer ran down early leader Kendra Schaaf (4th, 20:11.7) to win the individual title in 20:04.4. Leading the Seminole charge, Pasca Cheruiyot finished runner-up in 20:05.4. Pilar McShine also finished in the top ten for Florida State, placing 5th in 20:25.9. Virginia put three runners in the top ten, but all five of FSU's scorers were home before Virginia's fourth runner, and Florida State outscored Virginia for the win, 52 to 75. The men's 8K followed immediately. Virginia runners Emil Heineking (23:40.1) and Ryan Collins (23:40.5) took the top two spots, closely followed by Florida State's Matthew Leeder (23:42.2) and Ciaran O'Lionaird (23:43.6). The Seminoles next three runners (Jakub Zivec, David Forrester, and Wesley Rickman) finished in 11th, 12th, and 13th--and all five Florida State scorers were in before any other ACC school had seen their third runner across the line. FSU's winning total was 43 points, 38 ahead of runner-up North Carolina State. N. C. State edged out arch-rival North Carolina for the number two spot, 81 to 84. If Thomasville High School had to pick a theme for the GHSA Region 1-2A cross-country championships, it would have been something like, "It's our party and we'll win if we want to." The hosts from Thomasville won every title at stake at the meet at Pebble Hill Plantation on Thursday morning, 28 October 2010. Led by Rosalie White's first place finish, the Thomasville girls won the regional team title with 28 points. In the boys' race, Thomasville's Grif Rutherford was the regional champion, and the Thomasville team placed first with 56 points. It was a warm, humid morning that belonged more to the opening weeks of cross-country season than to mid-autumn and one of the last meets of the season. The sky was mostly cloudy, though, and never got clear enough for the sun to harass the runners. The girls' 5K race started somewhat after 10:30. Albany High School's Kair'Shay Jackson set the early pace, but by the end of the first kilometer she had been overtaken by Rosalie White of Thomasville. White continued to lead, but could never quite shake Jackson. With just under a kilometer to go, Jackson started to close on White, but then White smelled home and ran away from Jackson, winning the race 23:03 to 23:13. Loren Martin of Early County was third (24:12), while Kara Meng of Thomasville was fourth (24:29). All five Thomasville scorers finished in the top ten, giving the Bulldogs a winning total of 28 points. The top four teams qualified for the GHSA Championship Meet in Carrollton on 6 November 2010, and Thomasville, Albany (2nd, 47 points), Early County (3rd, 51 points), and Fitzgerald (4th, 96 points) made the cut. Jonathon Davison of Early County went to the front early in the boys' race, but soon fell back. Close to the end of the first kilometer Thomasville's Grif Rutherford became the new pacesetter, with Pedro Martinez of Fitzgerald on his heels. Martinez couldn't keep up the pursuit, though, and was passed first by Michael Johns of Early County and then Tony Jackson of Cook County. Johns kept Rutherford in sight, but couldn't catch him. Rutherford crossed the line first in 18:29, followed by Johns (18:42), Jackson (19:05), and Martinez (19:27). While Rutherford won by nearly 60 meters, the team standings were much closer--Thomasville only edged Fitzgerald for the regional title by the thinnest of margins, 56 to 57. Cook County and Early County were in a battle for third that was nearly as close, with Cook prevailing 67 to 69. The top four teams qualified for the state championships, but the season was over for Berrien County (5th, 113 points) and Albany (6th, 137 points). Aside from rudely winning everything in sight, Thomasville High put on a good meet for their guests. Pebble Hill Plantation is a beautiful venue, and the course the runners take through the plantation includes a variety of surfaces and terrain. In addition to course markings, Thomasville High had course marshals at every intersection and a lead bicyclist. Capital Region YMCA "Trick Or Trot" 5K and one-mile fun run. 8:30am ET one mile / 9:00am ET 5K. YMCA at Southwood, 3196 Merchants Row Blvd Suite 200, Tallahassee, Florida 32311. Course map. Entry form and flyer. Tasha Everette, teverette@capitalregionymca.org or 850- 701-0461. Celebration Baptist Church Fall Fest 5K and one-mile fun run. 9:00am ET. Event web page. Bobby York, byorkjr@msn.com or 850-443-6795. GroupFit Studio 5K & Kids' Hallowe'en Hustle. 8:00am ET. . Maclay Gardens State Park, 3540 Thomasville Road, Tallahassee, FL 32309-3413. Entry form and flyer. 31st annual Boston Mini-Marathon. 8:00 am ET. Commercial Bank, 124 West Jefferson Street, Boston, GA 31626. Entry form and flyer. Event page on Facebook. Brad Johnson, bradjohnson@bankcb.com or 229-498-8500 (day) / 229-226-4679 (evening). Spooky 5K and 1-Mile Fun Run. 9:00am CT. Fort Rucker Physical Fitness Center, Building 4605 Andrews Avenue, Fort Rucker, Alabama. 334-255-3794. 32nd annual Tricker Trek 10K and one-mile fun run. 8:00am CT 10K / 9:30am CT one mile. Marina Civic Center, 8 Harrison Avenue, Panama City, Florida 32401-2724. USATF certified course FL90031DL (10K). Online registration at active.com. Gumby Weckherlin, 850-271-5896, or Joe Edgecombe, joeruns@yahoo.com or 850-774-0018. Third annual Smithville Chicken Pie 5K/10.2K/1 Mile Fun Run. 7:30am ET 5K / 8:00am ET 10.2K / 8:15am ET one mile. Cedar St and Main St, Smithville, Georgia. Joy Sanders, sanders9716@bell south.net or 229-869-0064. Blountstown Health and Rehab "Run for Your Life" 5K & one-mile fun run. 8:00am CT. Blountstown Health and Rehab Center, 16690 SW Chipola Rd, Blountstown, Florida. 850-674-4311. Florida State Employees Charitable Campaign 5K. 8:30am ET. Southwood Office Complex, 4075 Esplanade Way, Tallahassee, Florida. Course map. Entry form and flyer. Event page on Facebook. Tim Unger, UNGERT@dor.state.fl.us or 850-617‐8832. Covenant Hospice & Fireman's Ladder Scatter 5K. 9:00am CT. Covenant Hospice parking lot, 4215 Kelson Avenue, Marianna, Florida. Event web page. Entry form and flyer. Online registration (and a course description) at active.com. Merian Milton, merian.milton@covenanthospice.org ; or Terri Glass, terri.glass@covenanthospice.org or 850-482-8520. Hog Jog 5K and one-mile fun run. 8:00am ET one mile / 8:30am ET 5K. Dooly County High School, 715 3rd Street, Vienna, Georgia 31092-1199. Entry form and flyer. Online registration at active.com. Emmy Reid, etreid@uga.edu or 229-268-4171. Third annual Professor Steven G. Gey 5K. 9:00am ET. FAMU / FSU College of Engineering, 2525 Pottsdamer Street, Tallahassee, Florida 32310-6046. Entry form and flyer. Online registration at active.com. Event page on Facebook. Barbara Leach, barbara.jean.leach@gmail.com or 850-766-0475. Bainbridge-Decatur County YMCA Veteran's Day Classic 10K. 9:00am ET. Bainbridge College, 2500 E Shotwell St, Bainbridge, GA 39819. USATF certifed course #GA98012WC. Entry form and flyer. Liv Warren, LivWarren@hotmail.com or 229-243-0508. 19th annual Run For Rover 5K and 1-Mile Fun Run. 8:00am ET 5K / 9:30am ET 1-mile. Thomas University, Pinetree Boulevard and Millpond Road, Thomasville, Georgia 31792. USATF certified course #GA91032WIN. Almost World-Famous YMCA Holiday Chili Run 15K / 5K /one-mile fun run. 7:45 am ET one mile / 8:30 am ET 15K and 5K. Albany YMCA Central Facility, 1701 Gillionville Road, Albany, GA 31707. Event web page. Entry form and flyer. Tracy Wallace, twallace@albanyareaymca.org or 229-436-0531. Cops for Kids 5K Trail Run. 8:00am ET. Tom Brown Park, Easterwood Drive, Tallahassee, Florida. Facebook event page. Entry form and flyer. Event page on Facebook. Mike Rogers, info@rogersdevelopments.com or 850-566-4131 or 850-566-2560. Second annual Florida Sheriff's Youth Ranch November Triathlon / Duathlon (sprint tri 750m swim, 20K bike, 5K run; intermediate tri 1500m swim, 40K bike, 10K run; sprint duathlon 5K run, 20K bike, 5K run; intermediate duathlon 10K run, 40K bike, 10K run). 7:30am ET. Florida Sheriff's Youth Ranch, 1813 Cecil Webb Place, Live Oak, Florida 32060. Event web page. Online registration at active.com. Chris Carusone, 941-799-7184. 16th annual Draggin' Tail 18-Mile Challenge / three-person relay / 5K. 8:00am CT. St. Theresa's Catholic ,2056 Sunny Hills Boulevard, Sunny Hills, Florida. Event web site. Online registration at active.com. Marty Kirkland 850-265-8439, or Joe Edgecombe, joeruns@yahoo.com or 850-763-5005. Albany Marine Corps Logistics Base Turkey Trot 5K. 8:00am ET. MCLB Golf Driving Range, 814 Radford Boulevard, Albany, Georgia. Entry form and flyer. Online registration at active.com. 229-639-5268. Santa's Sleigh Race. 10:00am CT.
FSU Krispy Kreme Challenge 4M Run. 11:00am ET. Westcott Fountain, Florida State University, College Avenue and Copeland Street, Tallahassee, Florida. Event page on Facebook. Thomasville Road Baptist Church 5K & 1 Mile Fun Run. 8:00am ET one mile / 8:30am ET 5 km and 10 km. Thomasville Road Baptist Church, 3131 Thomasville Road, Tallahassee, FL 32309. USATF certified course FL09036EBM (5K). Event web site. Grea Bevis, greabevis@yahoo.com or 850-508-0874. Lowndes High School distance runners Trevor Simmons, Caleb Coil, and Noah Coil took a Saturday morning off from cross country season to run the Think Pink 5K on the Valdosta State University campus. Their performance was the stuff that high school coaches' dreams are made of, with the trio taking three of the first six places. David Holland of rival Valdosta High School was twelfth in 22:28. But this was no cross-country race, and the win went to the Masked Avenger in 18:24, while Sirmans finished runner-up in 19:09. David Turner of Knoxville, Tennessee was the top master finisher, placing 15th overall in 22:59. Valdosta's Gretchen Bielmyer led the women's division with a 23:21, good for 17th overall. Less than a hundred meters back, Angel Godwin of Valdosta was the women's runner-up, 20th overall in 23:35. The fastest woman master in the race was Valdosta's Stephanie Moss (35th, 26:32). 255 athletes finished the Think Pink 5K making it one of the largest races in Valdosta. The race is an annual affair of the Eta Iota chapter of the Zeta Tau Alpha sorority at Valdosta State University. ZTAs across the nation are active in the fight against breast cancer, and ZTA of VSU hosts the Think Pink 5K during Breast Cancer Awareness Month as a breast cancer fundraiser. Michael Chisena flew down Tallahassee's Gallows Hill on College Avenue to a two-second victory in the 2010 Race To Live 5K. Chisena's ran 17:45 in the event, which started slightly after 10:00am on Saturday, 23 October 2010. Katie Showman was the top woman finisher in the race, completing the course in 21:17. Showman led the women nearly from the start. The men's race was in dispute all the way to the finish. The race started in front of the Zeta Tau Alpha house on College Avenue with a steep climb up to the Westcott building on Copeland Street. Many runners dashed up the first hill, apparently unaware that they still had three miles to go once they reached the crest. After the first hill, the race began a clockwise loop around the Florida State campus. The sprinters faded away, leaving the distance runners in front. Chisena was one of the leaders. By the end of three kilometers the lead pack was down to three--Alfred Nater, Michael Chisena, and Raley Beggs. At four kilometers the same three runners were the lead group, but Chisena was in front. The race finished with a climb on Copeland back up to Westcott, and then a downhill return to the ZTA house on College Avenue. The Race To Live 5K is held annually by the Florida State University chapter of Zeta Tau Alpha as a fundraiser to benefit the fight against breast cancer. Breast cancer funding is a national crusade for Zeta Tau Alpha; on the same morning less than a hundred miles away the Valdosta State chapter of ZTA was also hosting a fundraising race, the Think Pink 5K. FSU ZTA had hosted the race during the spring in past years, but moved the race to October this year--October is national breast cancer awareness month. ZTA does a fine job with traffic control, with marking the course, with having course marshals at every turn, with having superbly staffed water tables, and with turning out hundreds of students to run the race--many of whom don't run at any other time. But race results are handled unusually. That is, they aren't handled at all. For the purpose of awards, race bibs are color-coded according to division, and volunteers note the bib number of each color that crosses the line first. These are never cross-referenced with the runners' names or times, so the awards ceremony includes stirring announcements such as: "And the overall women's winner was...Number 867!" After a few such presentations you're waiting for someone to bellow Patrick McGoohan's line, "I am not a number; I am a free man!" The "Race To Live 5K" has been around for many years. Even at a new time of year it should remain a fixture on the Tallahassee running calendar. If you do run it in the future, remember to keep your pace controlled on the first hill and to bring your own stopwatch. Jay Smith outfought Juan Ordonez over the final yards of the race to win the 12th annual Alan C. Sundberg Memorial 5K in Maclay Gardens State Park on Saturday, 23 October 2010. Smith clocked 20:01.37 to Ordonez's 20:03.28. Dr. Mike LaBossiere was the fastest master of the morning, placing third in 20:20.07. Nancy Stedman was the top woman finisher and the first woman master, coming in 10th overall in 22:12.01. Stedman was over a minute ahead of the next woman, Cindy Geeker, who finished 12th overall in 23:19.63. It was a clear, cool morning, the best weather for distance running that Florida's Big Bend has seen so far this autumn. Chuck Davis took the pace out fast early, shadowed by Jeff Armstrong. By the beginning of the second kilometer Davis and Armstrong had a respectable margin on the rest of the field. That lead would not last. By the fourth kilometer Jay Smith and Juan Ordonez were out in front, occasionally swapping the lead, with Dr. Mike LaBossiere and Jeff Armstrong a few meters back. Davis had fallen back into fifth and out of contention. Over the final kilometer Smith and Ordonez got away from LaBossiere and Armstrong but could not escape one another. Smith held Ordonez off on the course's final downhill plunge toward Lake Hall, crossing the line with the win. LaBossiere made it in a few seconds before Armstrong (20:25.68), while Davis (20:38.60) barely hung on to fifth ahead of Camilio Ordonez (20:39.26). In the women's competition Nancy Stedman was in front by the end of the first kilometer and held the lead all the way to the finish line. Karima Anderson was in the second spot in the early going, but was overtaken by Cindy Geeker. During the fifth kilometer of the race, Geeker went by Anderson and built up a ten-second lead, beating Anderson to the finish line 23:19.63 to 23:29.48. 120 runners completed the Sundberg 5K. The race is held each year in the memory of Alan C. Sundberg, Jr., an attendant at Maclay Gardens State Park. Sundberg died of skin cancer in 1998 at the tragically young age of 33. All proceeds from the race go to benefit the Florida Skin Cancer Foundation. In addition to a great run through the park and a T-shirt, each participant in the race gets a skin-cancer screening. 2009 race story: "Mucchetti and Taylor grab wins at 2009 Sundberg 5K"
In southwest Georgia, the road to the GISA-2A state cross-country championships started at the GISA Region 3-2A championships at Greenwood Plantation outside of Thomasville, Georgia on Wednesday afternoon, 20 October 2010. On a beautiful day for cross country, the Brookwood girls won the Region 3 championship while Valwood's Mary Alice Smoot ran to the individual title with a 22:01 5K. Brookwood also took the boys' title, led by Stephen Robbins' region-winning 18:54. The girls' raced first. Mary Alice Smoot crossed the line for Valwood about a hundred meters ahead of the runner-up, Westwood's Virginia Vereen (22:28). Brookwood's first runner, Virginia Nash, was next in at 22:48. Valwood and Brookwood each put four runners in the top ten. Valwood's Smoot had beaten Brookwood's Vereen, but Brookwood's second runner (Leigh Stauffer) came in before Valwood's second (Ann Cannon), Brookwood's third finished before Valwood's third, Brookwood's fourth before Valwood's fourth, and Brookwood's fifth before Valwood's fifth. Advantage, Brookwood, 34 to 41. Westwood (3rd, 71 points) and Crisp (4th, 77 points) joined Valwood and Brookwood in advancing to the GISA State Championships. Nothing was close about the boys' race. Stephen Robbins' finished nearly 200 meters ahead of the runner-up, his Brookwood teammate Alex Carico (19:42). All five of Brookwood's scorers finished 11th or better for a winning total of 25 points, a mathematically unbeatable score. Valwood (2nd, 47 points) and Westwood (3rd, 59 points) were the other schools' whose teams qualified for the state championships. Matt Bradley (5th, 20:05) from Randolph Southern qualified as an individual for the state championships by finishing in the top ten. The Georgia Independent School Association (GISA) is the private-school counterpart of the Georgia High School Association, which governs sports for public schools. Westfield School will host the GISA state cross-country championships on October 30 at the Georgia Industrial Children's Home in Macon. 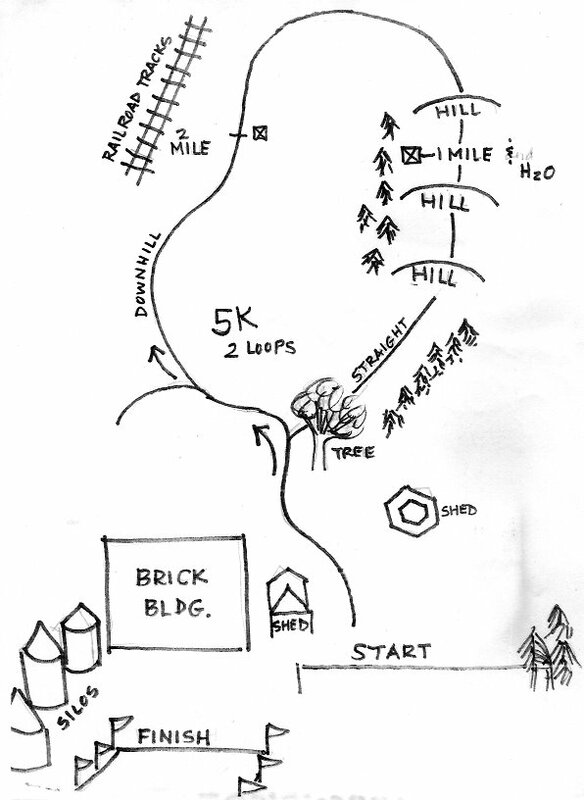 The two-loop course at Greenwood Plantation is Brookwood School's home cross-country course. The footing can be sandy for the runners as they follow the route through the upland forest of longleaf pines, punctuated by the occasional oak. The public can experience every hill of the Greenwood Plantation course on Saturday morning, 23 October 2010, when Brookwood hosts the Fun Run For A Cure 5K. The benefit for the Lewis Hall Singletary Oncology Center starts at 9:00am ET. 12th annual Alan C. Sundberg, Jr. Memorial 5K. 8:00 am ET. Maclay Gardens State Park, 3540 Thomasville Road, Tallahassee, FL 32309-3413. Event web site. Entry form and flyer. Bill Sundberg, bill@sundbergandhessman.com or 850-402-3000. ZTA's Race To Live 5K and one-mile fun run. 9:30am ET one mile / 10:00am ET 5K. ZTA House, 514 West College Avenue, Tallahassee, Florida. Entry form and flyer. Loren Zachary, 904-514-1595. Run Fun For A Cure 5K. 9:00am ET. Greenwood Plantation, Thomasville, Georgia. Debbie Beeson, dmbeeson@archbold.org or 229-403-9016. ZTA "Think Pink!" 5K. 8:00am ET. Valdosta State University front lawn, 1500 North Patterson Street, Valdosta, Georgia. Online registration at active.com. Hannah's Gifts of Hope 5K. 8:00am CT. Foundation Fitness Center. 17960 US Highway 431S #107. Headland, AL 36345-8459. Event web site. Entry form and flyer. Jay Jay Parker, thefoundationfitness@yahoo.com or 334 693-3488.